Tacos! They make for a quick dinner and they’re perfect for lunch the next day. The kids thought I was a rockstar for serving crunchy tacos. Meanwhile, I was ecstatic because it was the world’s easiest meal. I haven’t made hard tacos before, because I try to stay away from corn taco shells or tortillas if they’re not organic. You know, that whole issue with all corn being genetically modified? Okay, I won’t hop on my soapbox. But the good news is that at Trader Joe’s I found taco shells made from organic stoneground yellow corn. The store also carries a taco seasoning mix free of monosodium glutamate and partially hydrogenated oils. Shake the seasoning mix on a pound of ground turkey, beef, bison or chicken, along with some chopped onions and tomatoes, and simmer for about 10minutes and you’re done! The shells need to be crisped in the toaster oven for just a few minutes. Scoop some ground meat into each shell and top with grated cheese, salsa, guacamole, sour cream, etc. The kids loved creating their own. As a side, I made a black bean, corn and avocado salsa. Since I only had 1 can of black beans, I added 1 can of pinto beans, too. Then, I added a bag of thawed frozen corn, 1/4 cup chopped cilantro, 4 chopped tomatoes and 1/2 cup chopped red onion. I tossed the salsa in a dressing made from lime juice, olive oil and cumin. Lastly, I folded in some diced avocado (from 2 small avocados). When I packed it for S’s lunch the next day, I separated all the ingredients so the tacos wouldn’t get soggy. S said it was fun to build her own taco at school. Now, it’s time to go make myself a margarita! 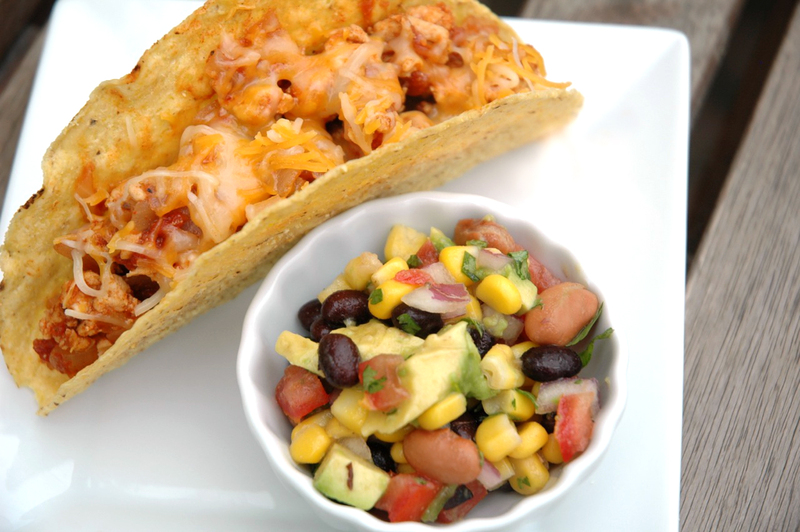 ** For a vegetarian option, you could fill the taco shells with the black bean, corn and avocado salsa. Remember the pesto from earlier this week? It’s making its appearance again—but in a sandwich, as a flavorful spread. 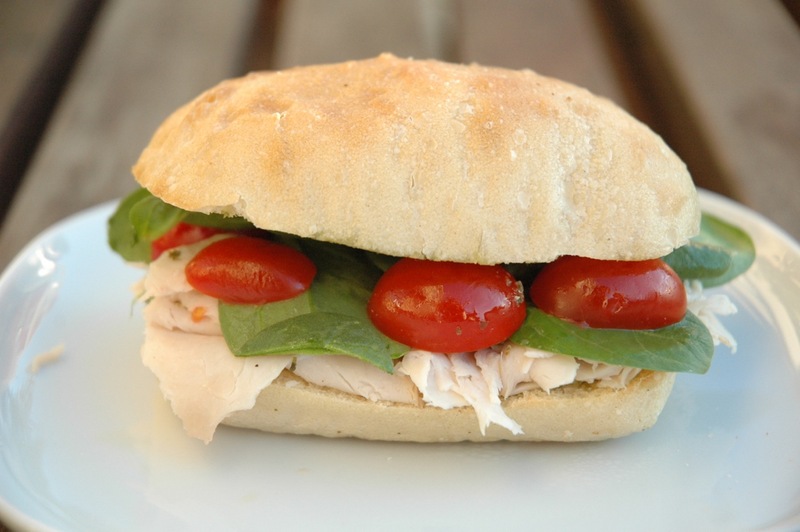 I topped it with smoked turkey, spinach leaves and little grape tomatoes. In the blink of an eye, I used up my five ingredients. I think it’ll be yummy, but it did not photograph well. Toppings kept falling out while I was trying to get a good shot of the sorry-looking sandwich. Then, the sun kept rising with every shot I took, changing the light. Ack! In any case, lunch is done. With the sandwich, I included a banana and some seaweed. I’m providing links to two interesting articles, one from last Saturday’s Wall Street Journal and the other from Wednesday’s issue of the New York Times. The first is about disgust and food, and how your rules for and responses to different foods can teach and trigger the emotion of disgust in your children. The author takes the reader on a fascinating trip around the world exploring foods that elicit the most visceral of reactions. I found out about the second article from one of my readers (also my father-in-law!). It’s a fun read on how one mom got her 10- and 14-year-olds to cook dinner. I think I’ll try some of her approaches at my house. Happy February!